A few years ago I bought some Route 66 fabric. I decided to make bags and aprons and such to sell at the shop. The supply will be limited by my time and materials, so there will be a limited number of them. 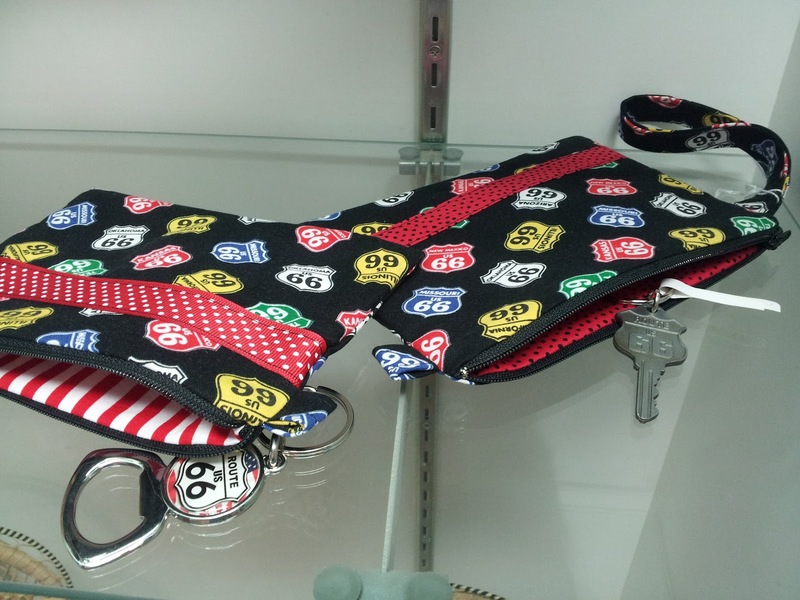 I've been searching and there is not much selection of Route 66 fabrics out there at the moment. 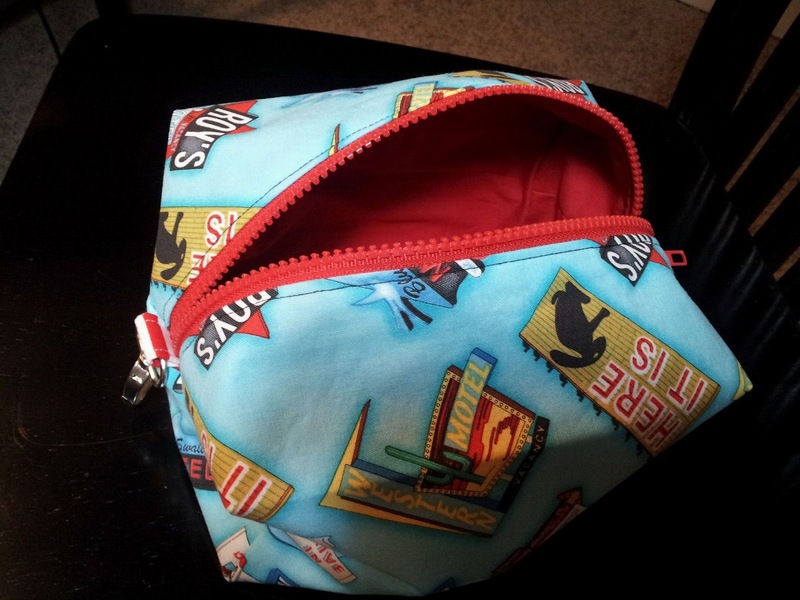 It's been a while since I've done any real sewing, so I started simple with a little wristlet. We've been getting requests for them at the shop and I sold one today. I figured out how to line them so that there's no raw edges on the inside. Then I decided to try this boxie bag from a tutorial at So Chick Handbags. It was more complicated but I just trusted her instructions and went step by step and voila! 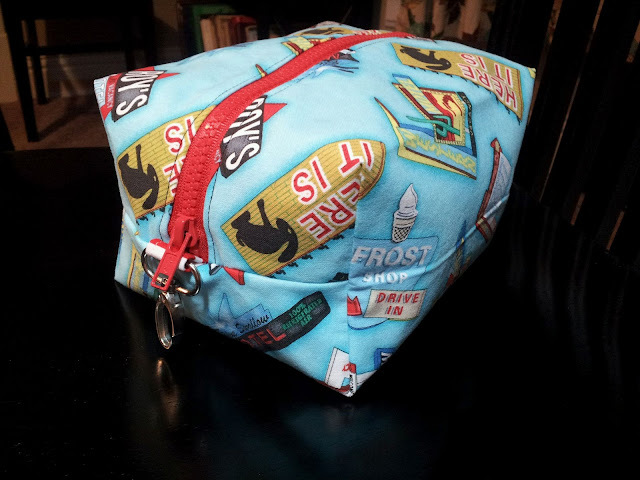 A cute bag perfect for make up or medicines or snacks or whatever you are packing on your trip! It's all lined with no raw edges on the inside. Raw edges are a pet peeve of mine...so I have to do away with them. Melissa's tutorial is written so that you end up with a beautifully lined bag. Now, that I've done one, maybe the next ones will go a little quicker. It's fun to be sewing again! The Pouches look great! I'm so glad you found my tutorial helpful and thank you bunches for sharing.... I'm loving the Route 66 fabric, too!